Pest description and crop damage These are similar to fruittree leafroller, but they overwinter as larvae and develop through two generations each year. Pandemis leafroller larvae are green with a green or brown head and are about one inch long when fully grown. 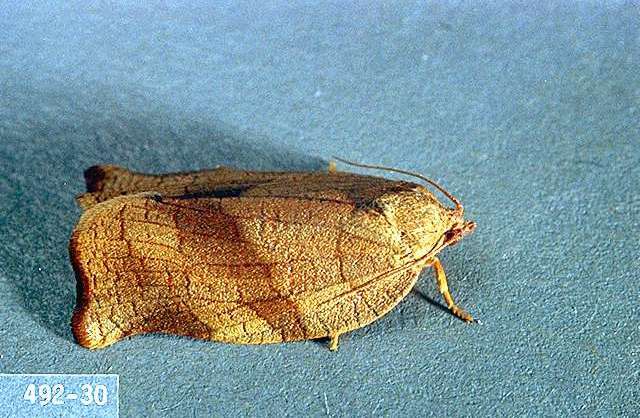 Adults are buff-colored moths with dark tan bands on the wings. They can be monitored with pheromone traps. Obliquebanded leafroller (OBLR) larvae are similar to pandemis larvae, except the head is dark brown to black. 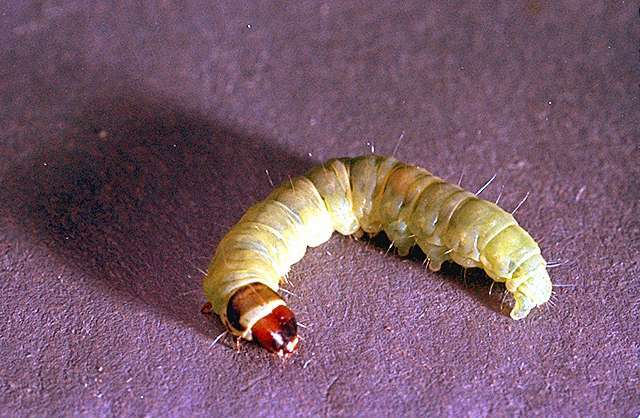 Larvae feed on leaves and enter cherry fruit, contaminating fruit. 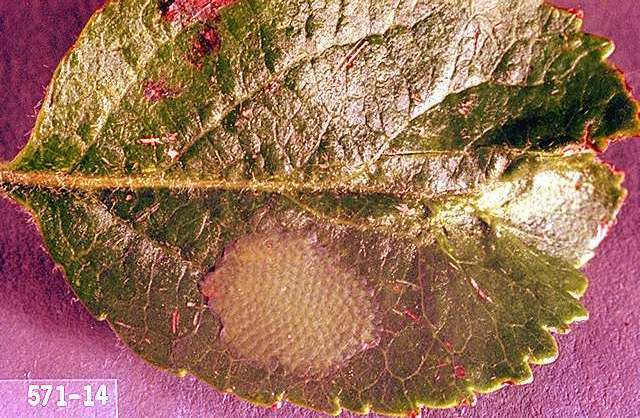 OBLR is the dominant leafroller pest in The Dalles and Milton-Freewater, OR. Biology and life history Second generation leafrollers overwinter as immature larvae under the bark on scaffold branches of a variety of host plants including many native species. Larvae may feed during warm periods in winter but become active in spring with onset of new growth. They feed for several weeks, then pupate in rolled leaves. Adult moths emerge in late April to May. These lay eggs for the second generation. The second generation hatches in early summer during cherry harvest. Larvae can feed in cherries creating small holes or enter through rain induced cracks. Pest monitoring Observe early spring growth for rolled leaves and feeding damage on new growth. 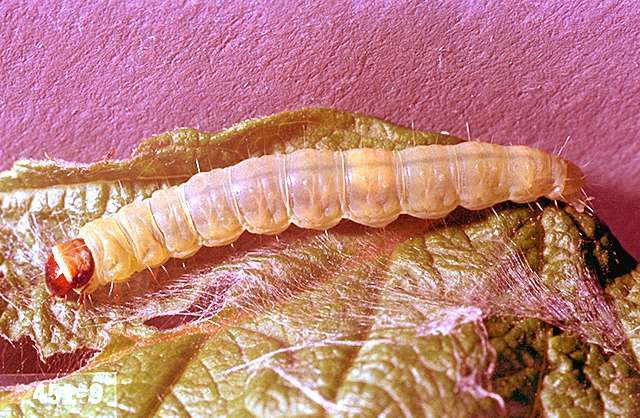 Very low temperatures in winter significantly reduce overwintering populations of larvae. Spiders and parasitic wasps as well as predators like the brown lacewing greatly reduce leafroller populations throughout the year. plant-derived essential oils-Some have shown efficacy against leafrollers. Some formulations are OMRI-listed for organic use. pyrethrins-Some formulations are OMRI-listed for organic use. -Highly toxic to bees. spinosad -Some formulations are OMRI-listed for organic use.--Toxic to bees. Bacillus thuringiensis kurstaki (Dipel, Javelin, and others)-Check label for rates. REI 4 hr. PHI 0 days. Nontoxic to bees. This biologically derived material acts slowly: effectiveness requires good coverage. Apply when forecast calls for warm daily temperatures. This material is less effective during cool weather when larvae are not actively eating. Some formulations are OMRI-listed for organic use. chlorantraniliprole (Altacor 35WDG) at 3 to 4.5 oz/a. REI 4 hr. PHI 10 days. flubendiamide (Belt 4SC) at 3 to 4 fl oz/a. REI 12 hr. PHI 7 days. Apply at popcorn stage. lambda-cyhalothrin (Warrior II) at 1.28 to 2.56 fl oz/a. REI 24 hr. PHI 14 days. May disrupt beneficial mite populations. Extremely toxic to fish; avoid spray drift and surface runoff. methoxyfenozide (Intrepid 2F) at 8 to 16 fl oz/a. REI 4 hr. PHI 7 days. Rates higher in the recommended range and additional applications at 10- to 18-day intervals may be required for heavy infestations, sustained moth flight, situations in which it is difficult to achieve thorough coverage, and for quicker knockdown of larvae. See label for biofix information. Do not apply within 25 ft of an aquatic habitat, 150 ft if applied by air. spinetoram (Delegate WG) at 4.5 to 7 oz/a. REI 4 hr. PHI 7 days. Maximum of four applications of spinetoram per season. Success 2F at 4 to 8 fl oz/a. REI 4 hr. PHI 7 days. Do not exceed 29 fl oz/a per year. Results are best when applied at petal fall. May act slowly. Resistance management Pandemis leafrollers and obliquebanded leafrollers can develop resistance rapidly to chemical controls.